Driving pleasure and sustainability are fused together in unprecedented fashion in the all-electric BMW i3 and the BMW i8 plug-in hybrid sports car. Their high-voltage batteries can be recharged quickly and easily by means of the BMW i Wallbox that forms part of the 360° ELECTRIC portfolio. This sophisticated charging station with fast-charge facility for feeding cars with power either at home or at work underlines the all-embracing approach adopted by the BMW i brand when it comes to developing products and services for sustainable mobility of premium calibre. In the process, the BMW Group has assumed a pioneering role in this field and is therefore pressing keenly ahead with the development of innovative technologies for making driving with zero tailpipe emissions more and more attractive. Systems for inductive charging of high-voltage batteries are the next step forward for energy supply. 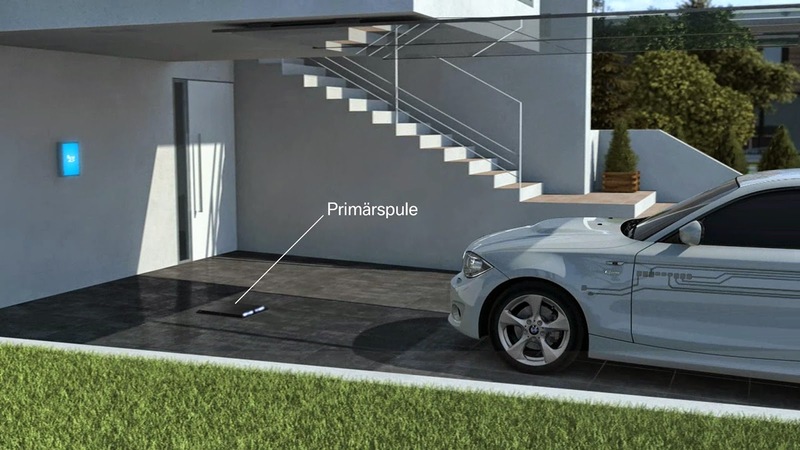 The development objective in the medium term is to put reliable, non-wearing and user-friendly solutions for inductive charging into production that have been tailored to both the batteries in the BMW i cars and the high-voltage batteries in future plug-in hybrid models from the BMW Group. 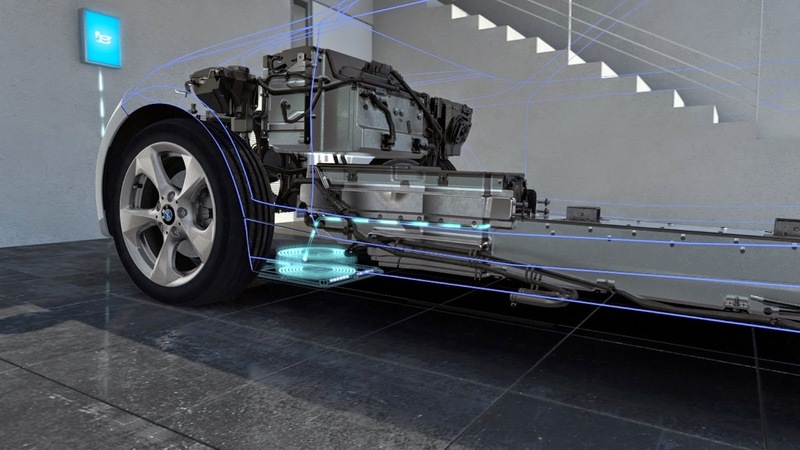 The crucial advantage of inductive power supply over conventional charging stations is the cable-free connection between the supply point and the vehicle’s high-voltage battery. Carmakers Daimler and the BMW Group have signed an agreement on the joint development and implementation of a standardised technology for inductive charging of electric cars and plug-in hybrid vehicles. 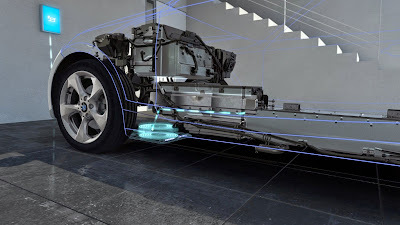 The system consists of two components: a secondary coil in the vehicle floor as well as a base plate with integral primary coil that is located underneath the car, for example on the garage floor. The arrangement of the coils, and consequently of the field pattern, is based on a design derived from their circular shape that offers a number of crucial benefits. These include the extremely compact and lightweight construction along with effective spatial confinement of the magnetic field. The electrical energy is transmitted via an alternating magnetic field generated between the coils, contact-free, without charging cables and at a charging rate of 3.6 kW. With an efficiency factor of over 90 percent, this method enables the high-voltage batteries in vehicles to be charged efficiently, conveniently and safely. A further development target is to minimise the charging time for contactless power transmission. At a charging rate of 3.6 kilowatts, the high-voltage batteries in many plug-in hybrid vehicles can be fully charged in under three hours. It takes less than two hours to charge the BMW i8 using a fully working prototype of an inductive charging station. In order to make allowance for the higher storage capacities of high-voltage batteries in pure-electric vehicles, the future technology standard also foresees the possibility of increasing the charging rate to 7 kW. This ensures that the battery in the BMW i3 could still be fully charged overnight when using the inductive system. Inductive charging makes life considerably easier for the driver of an electric or plug-in hybrid vehicle, as there is no need to connect any cables to top up the power reserves. Once it has been correctly positioned above the primary coil, the driver can simply start the charging process at the push of a button using the vehicle’s own operating system. Data is transmitted via a WiFi connection between vehicle and charging station to help the driver even with parking. As with today’s BMW i Wallbox, the inductive power supply systems of the future will also make it possible to activate and monitor the charging process from a smartphone. The relevant smartphone app will let drivers call up the data transmitted online on the battery’s charge status, for instance, or the time remaining until charging is complete.